Long story short: I found it to be a pretty harmless book that I'm sure will appeal to some Middle Grade readers with an interest in mysteries and slice-of-life types stories. However, the confusing crossover between genres might turn off struggling readers, while the slow start might turn off readers looking for an engaging read all the way through. Also, the cover is beautiful. If you're interested in more detail, keep reading. I'm going to structure my critical review into two parts for the tw Long story short: I found it to be a pretty harmless book that I'm sure will appeal to some Middle Grade readers with an interest in mysteries and slice-of-life types stories. However, the confusing crossover between genres might turn off struggling readers, while the slow start might turn off readers looking for an engaging read all the way through. Also, the cover is beautiful. If you're interested in more detail, keep reading. I'm going to structure my critical review into two parts for the two biggest things that stuck out to me in this book. 1. Genre. This book reminded me of Bridge to Terabithia and Flipped, just with a mystery/parallel universe twist. When it comes to Middle Grade, I've never been much of a fan of realistic fiction, so I did appreciate the parallel universe weirdness. It takes a bit of a while to get to that point, though, and until you do it's a bit confusing what the genre is. It seems that the author tries to set you up for the fantasy of it by name dropping fairies, ghosts, and other mythical creatures, but then the book never goes in that direction. To be clear, this book has ghosts in it but it is not a ghost story. It's much more a story of children's imagination tinting everything they do until the call to action happens (about 1/3 of the way into the book). 2. Plot. The story gets off to a slow start and the stakes are a bit nebulous. At the core of the novel is the mystery of what happened to the great-grandparents - who killed whom? Why did both disappear? Hautman introduces some conflict between Stuey's and Elly's mothers based on this old mystery, but since we don't see the conflict itself (the kids are in a different setting when the parents are, apparently, arguing), the stakes for that conflict are very low. It seems for a while like the conflict might come in the battle for preserving the woods, but then that also happens mostly behind the scenes. Finally, when the actual call to action happens, you can see how the old mystery is meant to play into the story. The story gets much more interesting then, because now the new mystery makes the reader question: Is it tied into the old? What is going on? How will they solve it? Without including spoilers, I'll just say that I found the solution to be a bit anti-climactic, mostly because the characters didn't learn or grow beyond discovering the truth of the great-grandparents. The book mostly tracked them going about their own lives, and when they do make strides in solving the parallel universe split, that is mostly by whatever magic is operating behind the events of the novel. The characters don't take much control over their own lives (and when one does, his or her activities are shunted to the Adult Table, to do whatever they do behind the scenes and then tell the children about it later). We get a lot of childish conversation between the children, which ultimately do little to drive the setting, character, or plot. In terms of setting high stakes and writing engaging characters, therefore, I felt that this book fell a bit flat. When Stuey was eight years old, a terrible storm came through his town. While Stuey and his mom went and hid in the cellar, Stuey's grandfather decided to wait it out in his cottage guarding a book he had been writing. After the storm subsided, Stuey found the pages of his grandfather's book strewed around the room and that his beloved grandfather had passed away. Since then, Stuey likes to explore the families orchard, wander through the meadow and spend time in his favorite spot within the pop When Stuey was eight years old, a terrible storm came through his town. While Stuey and his mom went and hid in the cellar, Stuey's grandfather decided to wait it out in his cottage guarding a book he had been writing. After the storm subsided, Stuey found the pages of his grandfather's book strewed around the room and that his beloved grandfather had passed away. Since then, Stuey likes to explore the families orchard, wander through the meadow and spend time in his favorite spot within the poplar grove where nestled among the trees he found the remnants of a golf course, originally built by his great-grandfather. Hidden even further in is also a deadfall or a group of five entangled trees creating a spot where just the right size kid can crawl inside. A secret fort. Stuey is a slightly shy and lonely boy, until the summer he meets Elly Rose. Elly lives on the other side of the woods and shares the same birthday as Stuey. They both have quite the imagination. At first, Stuey doesn't know what to think of Elly Rose, especially after she says they're to become "soul mates" and starts talking about a magical kingdom within the woods. However, Elly's stories about Castle Rose win him over. Not only does Stuey share his special spot with Elly the two quickly bond and become the best of friends. Then one day while playing in the woods, Elly vanishes before Stuey's eyes. As the story progresses, we learn of a feud that existed between Elly and Stuey's family dating back to their great-grandfathers. Stuey's great-grandfather was a bootlegger who tried to go legit by building a country club and golf course. However, he had horribly discriminatory practices in his admissions to the club. Elly's great-grandfather was a district attorney and sought to put Stuey's in jail. In the end, both of them went missing following a horrible disagreement. Thus, setting up the mystery surrounding what exactly happened to the two of them. The overall plot is slowly revealed with a huge twist somewhere around the middle that I never saw coming. It totally blew me away with how the direction of the story changed from not just being a mystery about the past. I really don't want to say too much more about it, cause spoilers, but wow Hautman had me guessing as to how things were going to resolve. Otherwood's a much deeper read than I was expecting. At first, I thought it was going to be along the lines of something like Bridge to Terabithia, a fantastical tale of kids creating a hidden world in the forest. Which is a very small part of this story, but there are also ghosts, themes of the loss of a grandparent, discrimination, grief of a missing friend, mans impact on the environment, reality, perception, memory, secrets and holding onto a friendship. Hautman's afterword where he states how the book was a "eulogy to the woods that live now only in my memory" leaves you with a lot to think about. It's funny how I didn't understand what was going on and still love this book! Will definitely write a review of this book!! Seemingly, that’s what happened in this novel where Bridge to Terabithia meets Stranger Things. Otherwood tells the story of Stuey and Elly Rose, two adventurous kids who like to explore the woods and play make believe. When Stuey is eight years old, a great storm hits, taking with it his grandfather’s life and leaving behind a mess of secrets. When Stuey meets Elly Rose, they discover that they share the same birthday and that they have the same secret place in the woods, a deadfall of trees that Elly has named “Castle Rose.” It’s here that the two often meet up to play as knights and queens and expand their ever growing and changing imaginations. But one day, while sitting under the deadfall, Stuey divulges a part of history to Elly that has to do with both of their families and it causes Elly to disappear before Stuey’s eyes. It’s then that the whimsical nature of the book gets a little more otherworldly. The town searches for Elly, but she’s nowhere to be found. Upon returning to Castle Rose one day, Stuey is shocked to see Elly there waiting for him, only to learn that wherever she is, Stuey is the one who has gone missing. 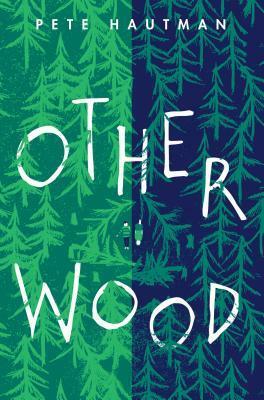 Chalked full of quantum physics for kids, and the idea of multiverses, Otherwood explores friendship, loss, and never giving up hope. Years pass, and still Stuey and Elly Rose fight to find a way to bring their worlds back together. This book was so creative and fun and sad and beautiful. The characters are wonderful and well developed. The pacing is a little slow in the beginning, but once Stuey and Elly Rose meet, the pages started flying by. There are little bits of foreshadowing here and there and the eventual fix is one that you can kind of see coming, but overall, I really enjoyed this book and the atmosphere and imagery it presented.